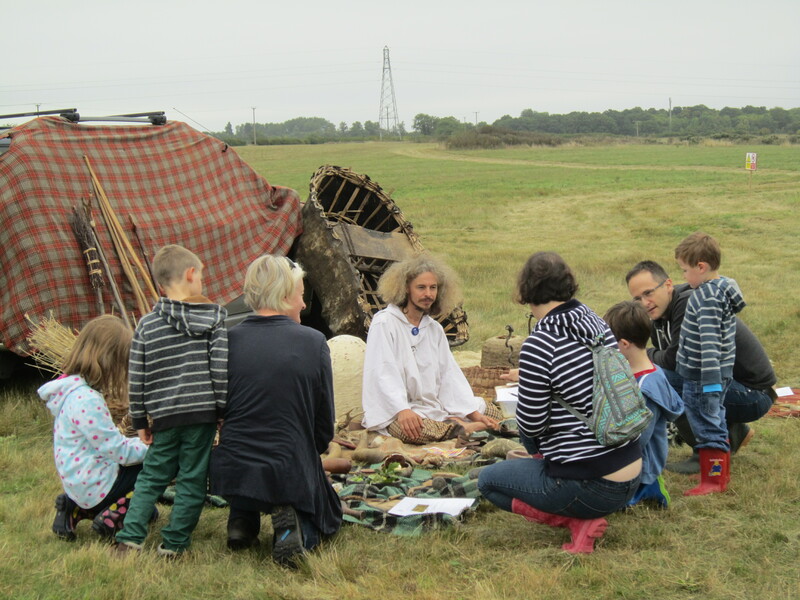 The Prehistoric Pottery workshop run by Ricky, another of our volunteers, was also extremely popular. 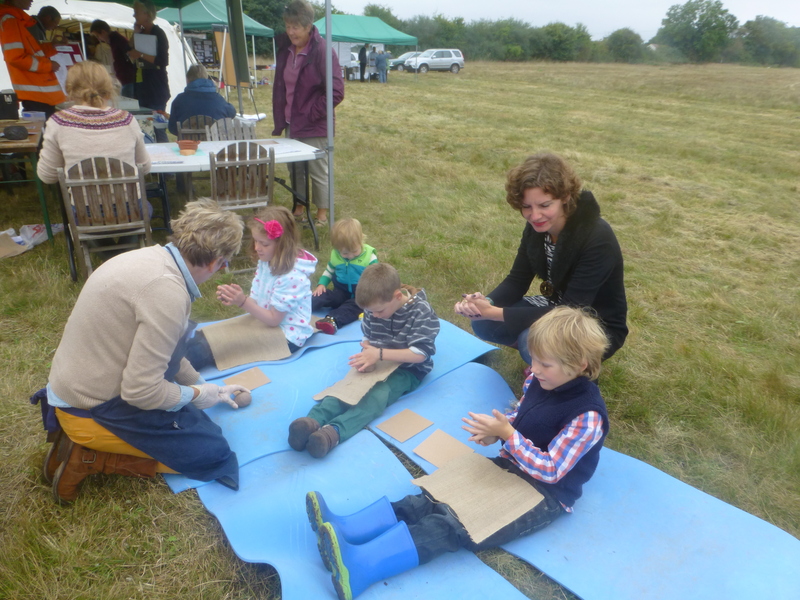 Many of the children chose to do thumb pots made from a ball of clay which they decorated with very creative designs made using animal bones and wooden tools, just as they would have done in the past. Others made more elaborate coil pots under Ricky’s tuition, which any Iron Age person would have been happy to eat their morning’s porridge out of. 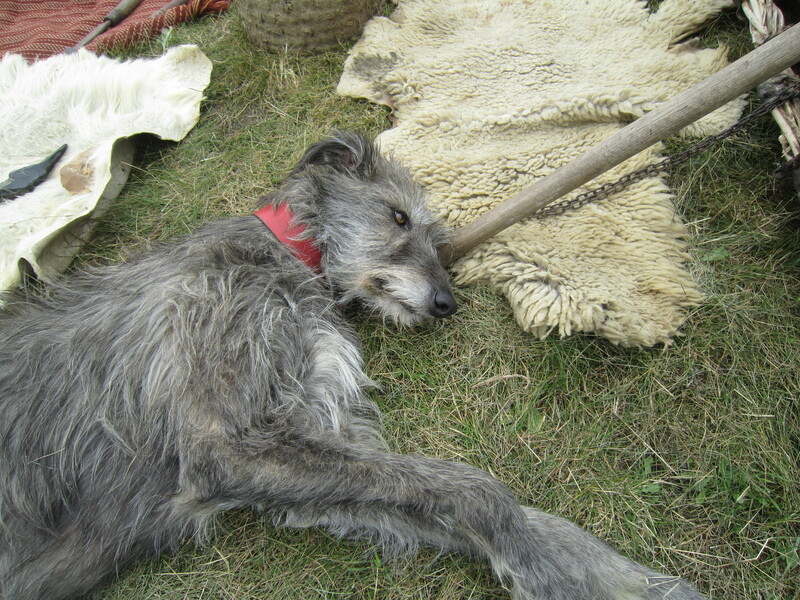 Celtic Chris, a regular visitor to the site, had a whole range of fascinating prehistoric tools and craft equipment to show people and attracted a big audience for his story-telling sessions accompanied by ‘Bear’ his ‘prehistoric’ dog, a lovely lurcher cross-breed, to assist in the task. 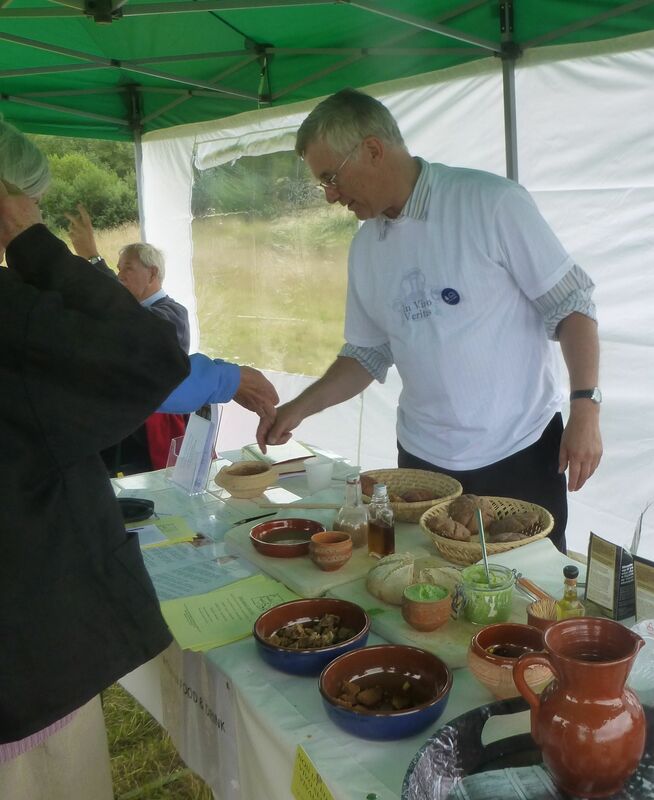 We had a variety of stalls, including one with an array of beautiful early prehistoric flint tools, another exhibiting both Roman and prehistoric pottery dug up from Trendles alongside complete examples of real Roman vessels, and a stall set up by David Ashby displaying the results and ongoing work of another very interesting local project at nearby Stanford-in-the Vale. Although the excavations on Trendles Field finished in 2011, a number of the trenches are still open, with some of the foundations of the Roman buildings and many of the Iron Age pits still visible. Tours of the site were led by Gary Lock, the Site and Project Director, and Eric Dunford and John Hawes, two of our project volunteers. The biggest feature on the site is the large circular arena, where various religious displays and activities would have taken place, and is still open to view. The large stone drain that used to keep it dry is now blocked and as this area is naturally waterlogged it still retains a lot of water in the rainy season and has become the home to many bulrushes, frogs and other wildlife. Looking at how quickly this and some of the other excavated trenches have silted up demonstrates very clearly how the stratigraphic layers we archaeologists spend so much time interpreting, build up over time. Another really fascinating feature on the site and included in the site tour, was the waterlogged pit and more about this can be read in our article. 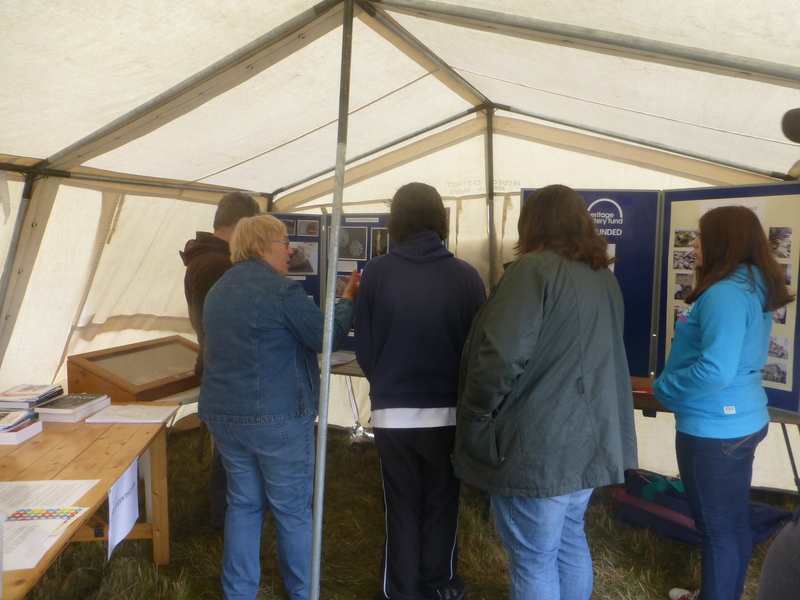 It was also an opportunity to have another finds identification day and we had a number of visitors to our finds desk, bringing an assortment of pottery of all periods (including a beautiful piece of a medieval glazed jug); some curious porcelain figurines; and a variety of metalwork including military buttons. 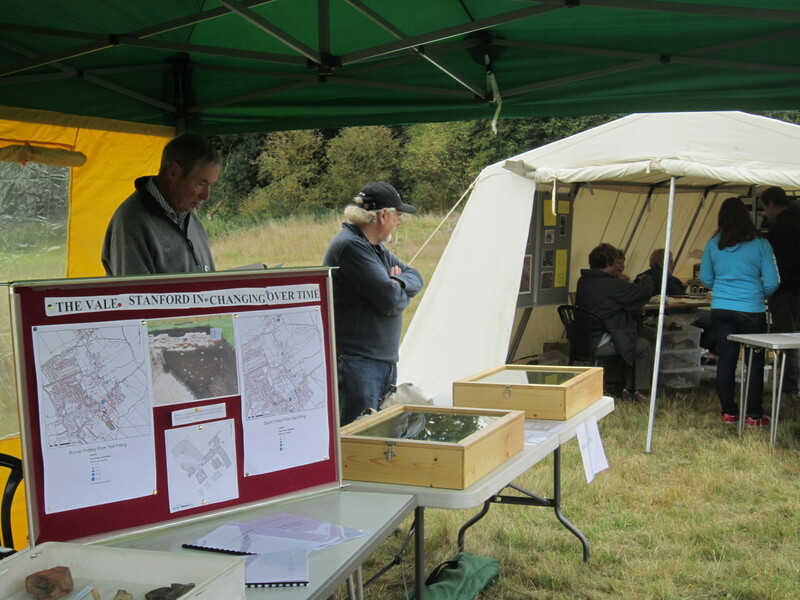 Thanks to all our visitors and the hard work of our volunteers, the Open Day was a great success and hopefully new visitors to Trendles Field learnt something about the mysteries of this ancient temple site, and also about our current community project which pieces together the results from the eleven seasons of excavations. 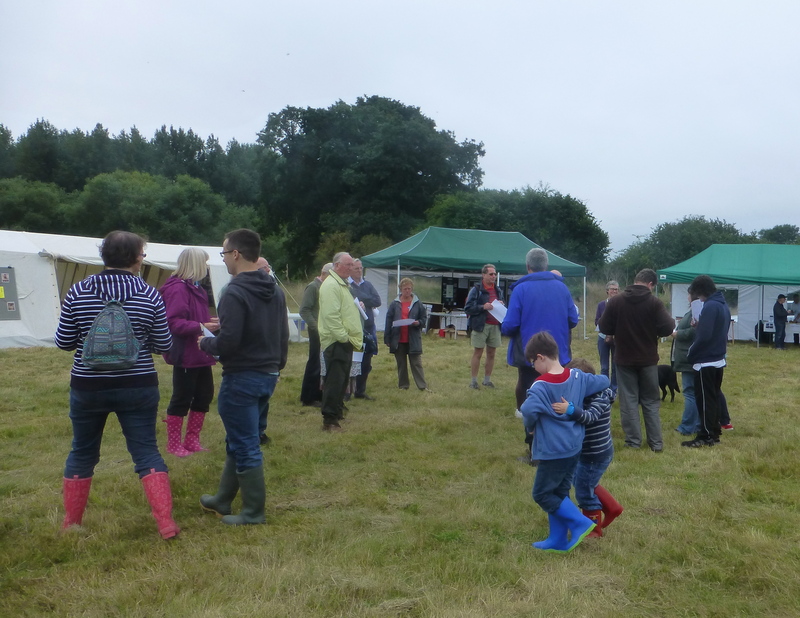 It was a great end to our first year on the Trendles Project, and next year we hope to welcome many people back again to join us in a week-long series of activities.